The A249 that cuts through the Kent Downs between Maidstone and Sittingbourne, or more importantly between the M20 and M2, is a very busy road. Known locally as Detling Hill, it is a major access route that cuts a corner and shortens a trip between the M25 coming from the west, and the Channel ports. 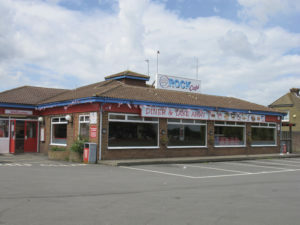 It is 40 miles from Dover, and so a handy stopping-off point for anyone hungry for a snack on a long trip. 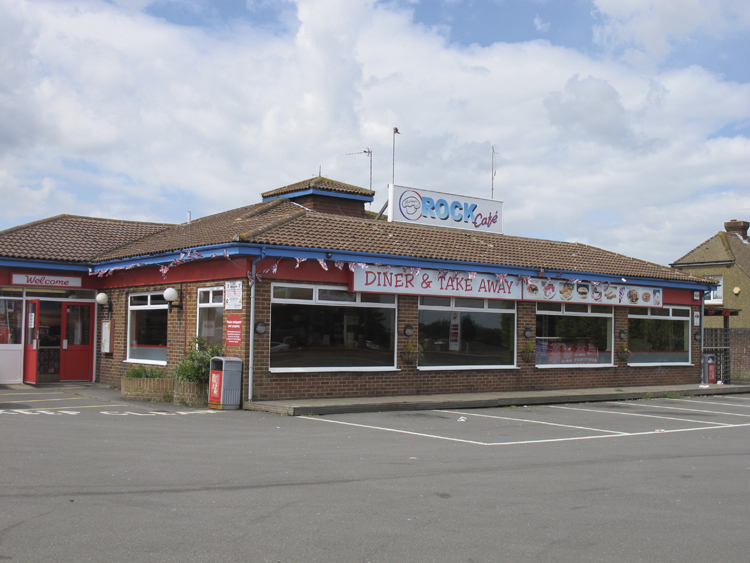 There used to be a ubiquitous Little Chef on the site where this characterful little roadside eaterie, Mickey’s Rock Café, now stands. 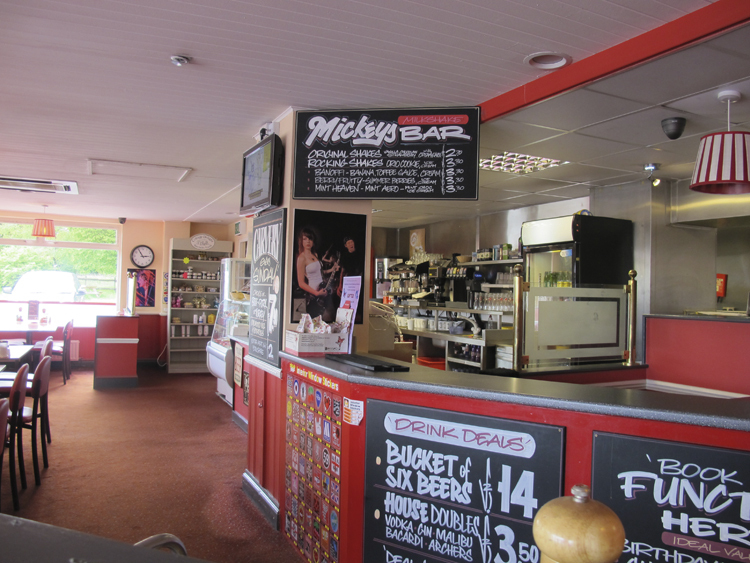 This is the second Mickey’s establishment – the original, run by Mickey himself – is alongside the A229 on the other side of Maidstone, and is notable for the squawking parrots in their cages that greet you at the entrance. This newer one is also a family establishment, run by Mickey’s daughter, and is the jollier of the two. 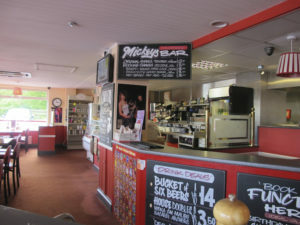 The café is vibrant with colour. All the tables, chairs and lower walls are bright red, giving the place a warm aura. The rest of the décor is an eclectic mixture of cars and rock, with some cheery nationalism thrown in. There is a big picture of Elvis, murals of fabulous ‘50s American cars, motorbikes and guitars, alongside large Union Jacks. Low walls, just above shoulder height, separate sections of the café to give a more intimate feel, and they are topped by model cars. Look up, and the ceiling is decorated with clusters of old vinyl record albums. While we were there, ‘50s rock and pop music played continuously, at a pleasant level that didn’t dominate if you wanted to chat. The menu is typical café fare, everything from light bites of croissants and Danish pastries, through cheese-on-toast, hot dogs and ‘The American Breakfast’, to steaks, ‘Surf and Turf’ and chicken dishes. Typical fare is steak and eggs, an 8-oz rump with a pile of scrambled eggs and hot buttered toast, at £8.50. Or there’s three American pancakes with maple syrup at £3, or six for £5.50. For a healthier choice, a selection of fruit is just 90p. Good coffee, friendly service and a memorable ambience make this a café worth visiting. We were served very quickly, but some complain on Trip Advisor that at busy times it can be a little slow. There’s plenty to look at while you’re waiting, though.